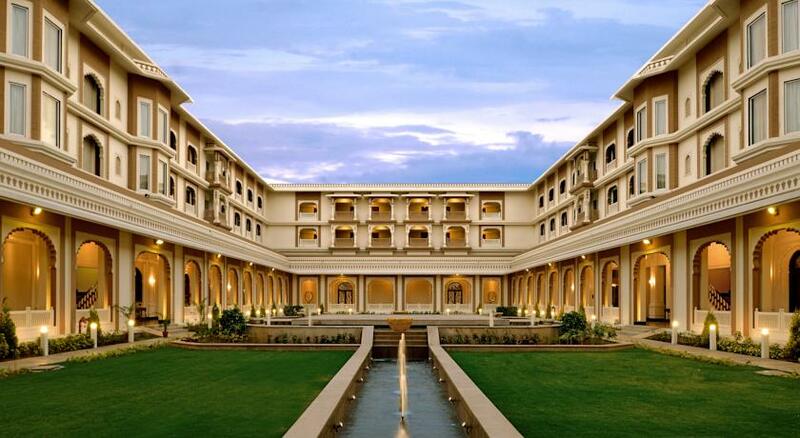 The Indana Palace Jodhpur is a luxury hotel at Shikargarh. 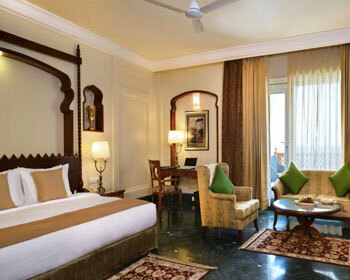 The palace can be reached from Jodhpur railway station and from Jodhpur Airport both within 6 km of range from the hotel. 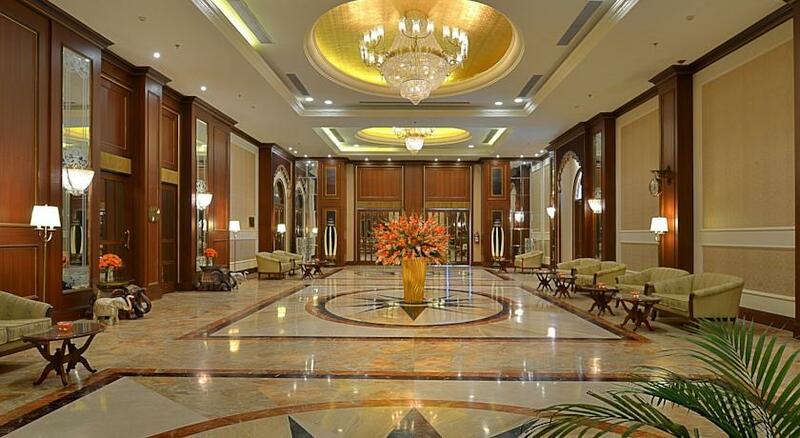 When booked from the website, Hotel provides complimentary transfer from the Airport. The ‘Blue’ city Jodhpur is a place for rich heritage. 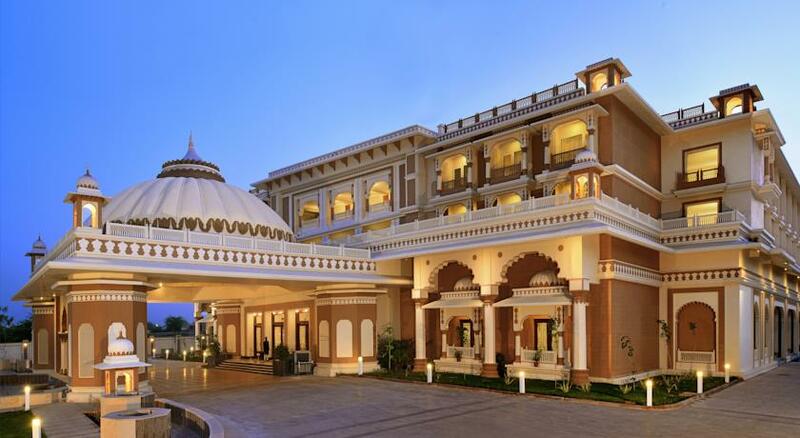 Take car rental services by palace for local sight seeing to drive up to Mehrangarh Fort, Rani Ki Chattri, Umaid Bhawan Palace, Jaswant Thada, Government Museum and Gangaur within 10 km of range. Guda Bishnoi and Osian are other places of interests too. Lake Balsamand and Lake Kaylana are a not to miss in the evening. The famous Sardar Market at Ghanta Ghar is known as shoppers’ paradise for local food and handicraft collection. 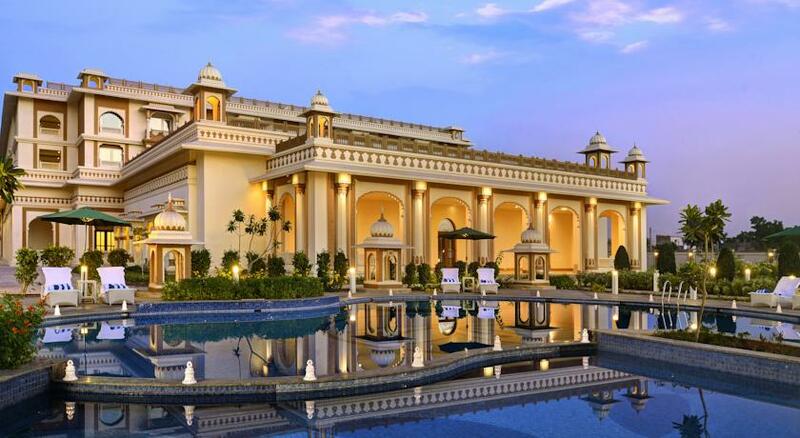 For recreational activities, Palace provides Camel Safari, outdoor swimming pool, Spa treatment by SVA, relaxing Jacuzzi, health club and beauty salon. 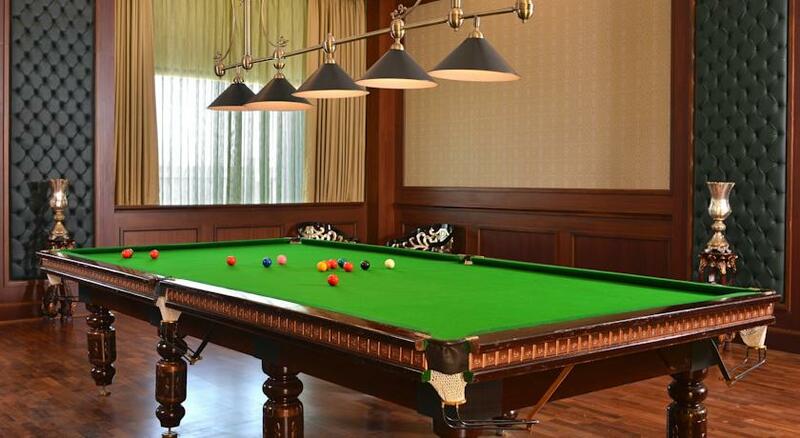 Enjoy billiards and Children’s play area. 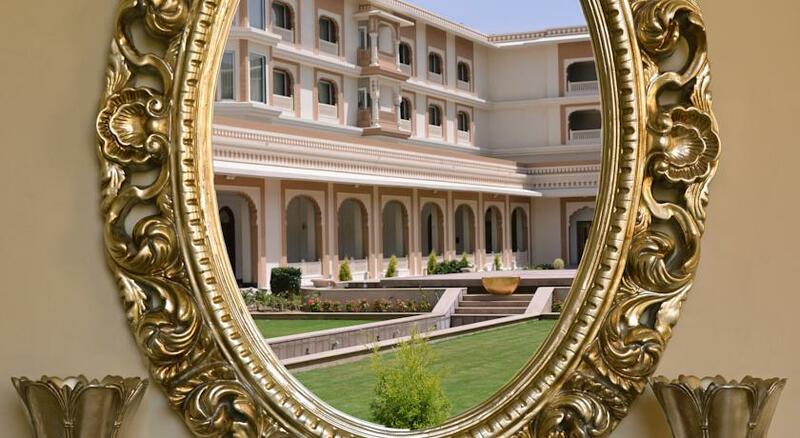 Palace has in-house shops for local arts & crafts, fashion, jewellery and other Rajasthani items. 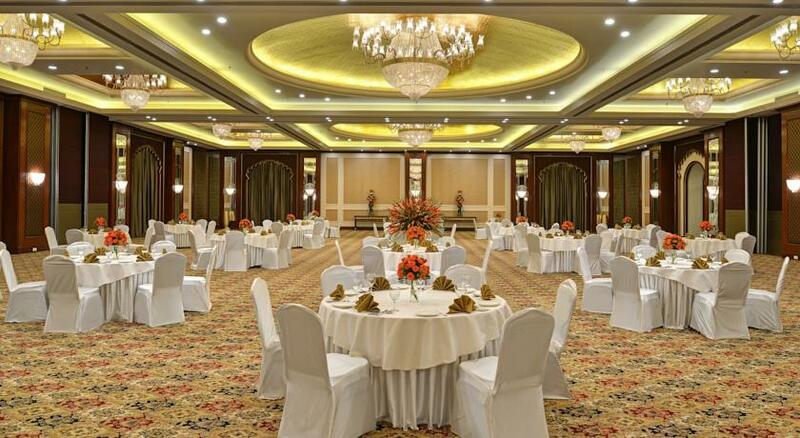 Rang Mahal, Jal Mahal, Hawa Mahal, Marwar Hall and Mewar Hall are the best venues to book for business meetings, corporate meetings, weddings and other special occasions. 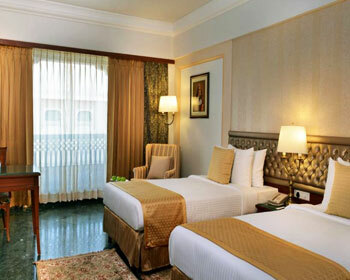 The Executive rooms are provided with soft twin beds with premium bedding. 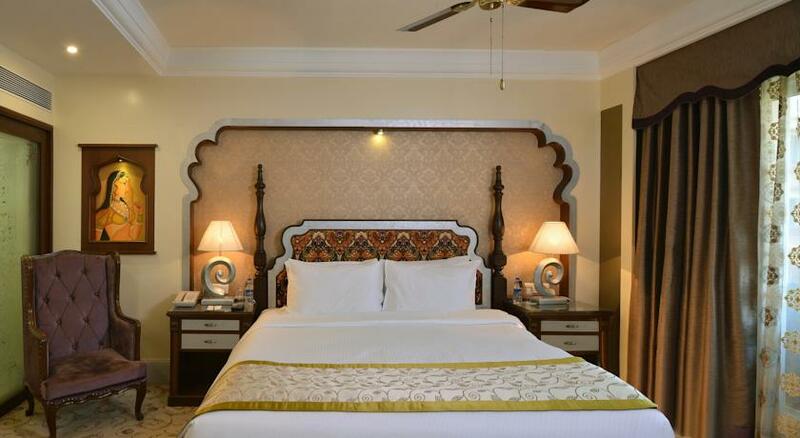 The marble floored room is equipped with traditional carved work desk and chair, local artwork hand-painted walls, use of designer lamps and ethnic ‘Jali’ work throughout the room to give it an ambience of Rajasthani tradition. The room window opens to the inner courtyard of the palace. The fully air-conditioned room is given window side sofa. 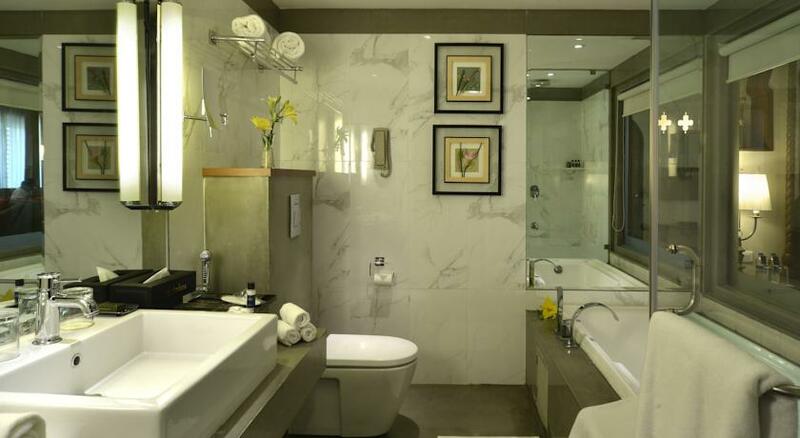 Your modern furnished attached bathroom has walk-in shower cubicle, make-up & shaving mirrors, Hair dryer, bathrobe, slippers and other essential bathroom toiletries. 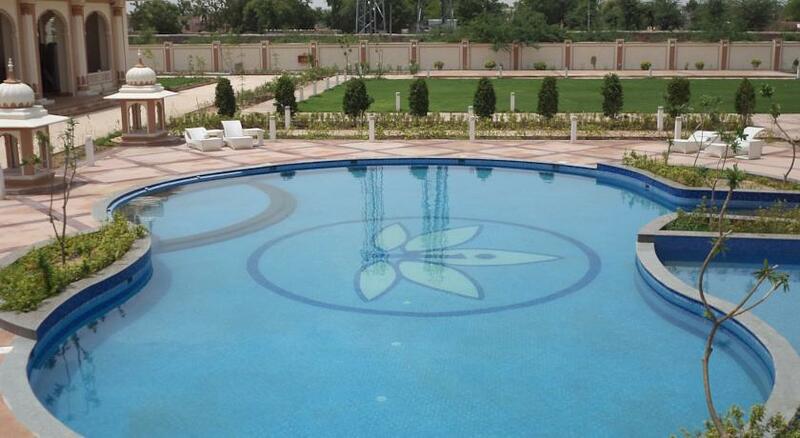 Bathroom is provided with hot & cold running water facility. There is telephone connectivity in washroom too. 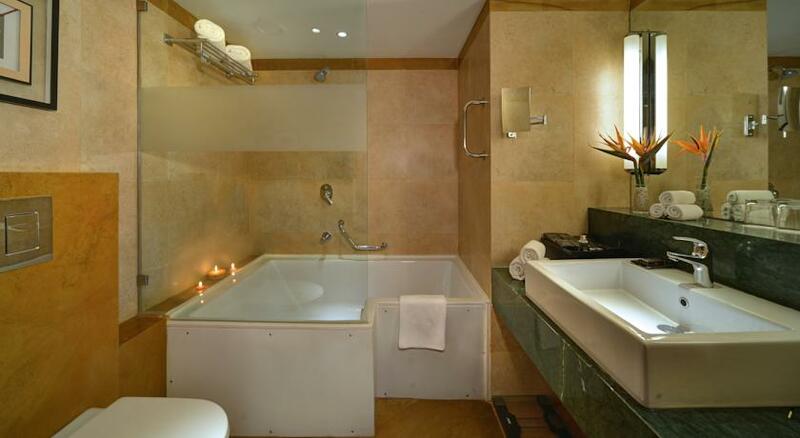 Get indulge with private mini bar, Fruit basket or tea coffee maker. Other in-room amenities are - Wi-Fi internet connectivity, 24-hour room service, cable television with movies on demand, complimentary newspaper, Iron & ironing board and Safety Locker. 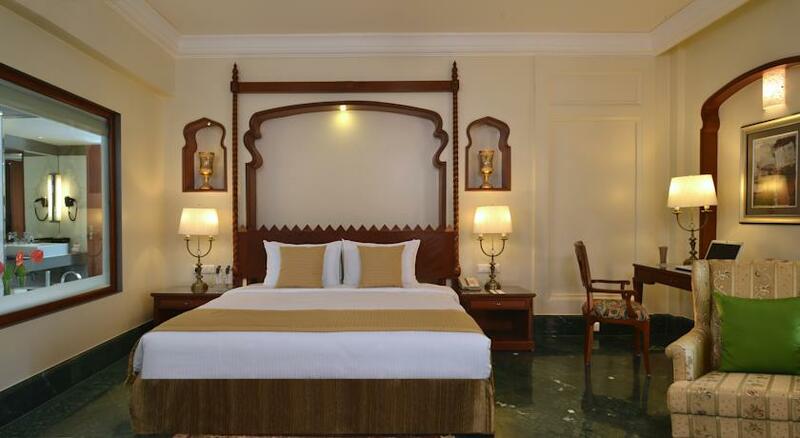 Premium rooms are given a plush King Sized double bed with premium linens. 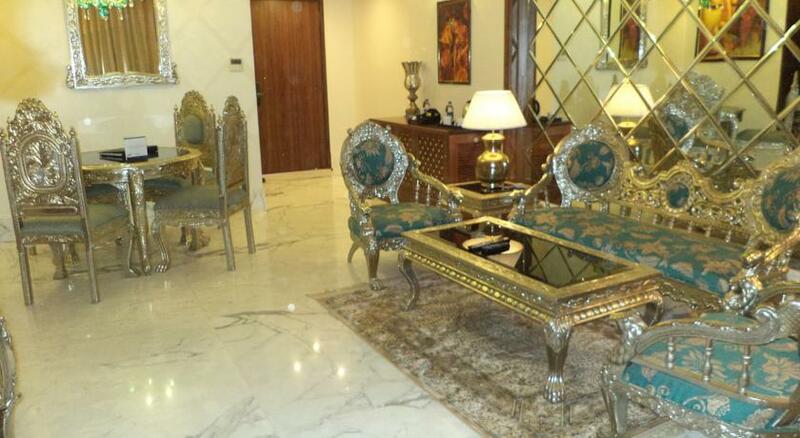 The marble floored rooms come with two options, private sit-out area for the ground floor or attached balcony for upper ones. 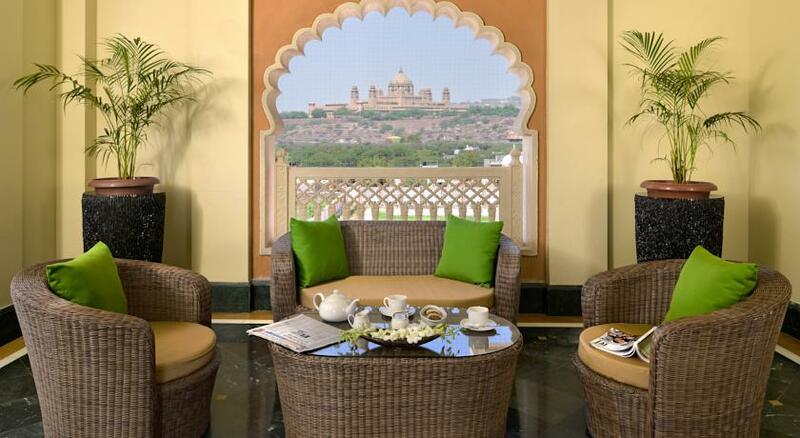 Both cover the pleasant view of Umaid Bhawan Palace as well as Mehrangarh Fort. 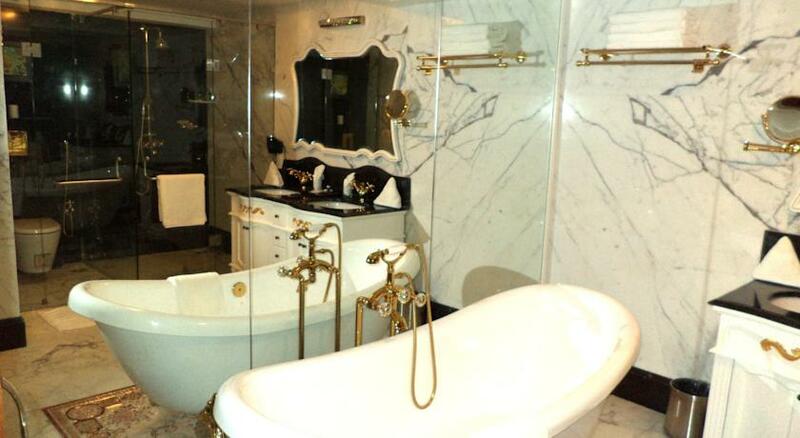 The completely marble floored rooms have a modern furnished attached bathroom equipped with bathtub to soak in, hair dryer, make-up & shaving mirrors, slippers, bathrobe, running hot & cold water facility and other essential luxury toiletries. The fully air-conditioned rooms are a showcase of Rajasthani culture with hand-painted wall of local artwork, ethnic ‘Jali’ work on the windows and traditional designer lampshades. For your entertainment, there is cable television with on-demand movies, a private mini bar and tea coffee making machine. Stay connected with Wi-Fi internet access and telephone facility. There is Executive work desk for quick office wind up work. 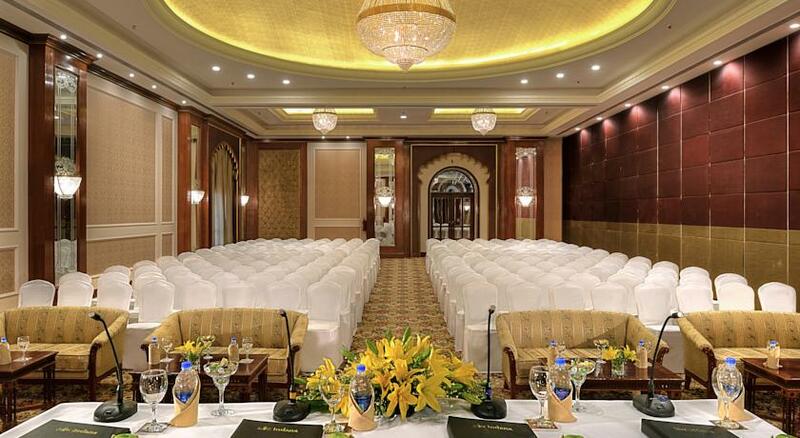 At your hospitality palace provides Fruit basket in the room, Iron & ironing board and 24-hour room service. Safety Locker & daily newspaper is also provided. 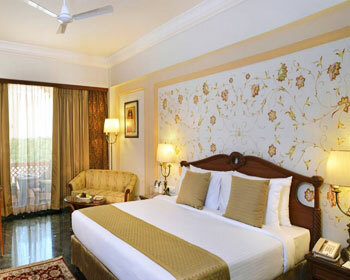 Junior Suite rooms are luxury living rooms for small families or groups. 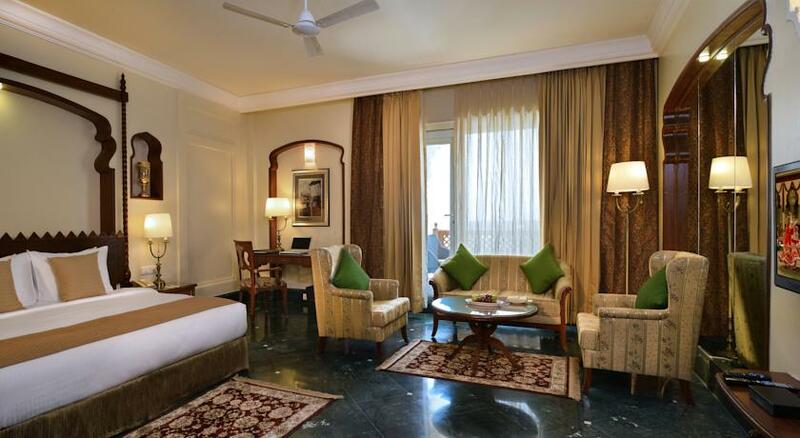 The comfort of a suite is given in a room. 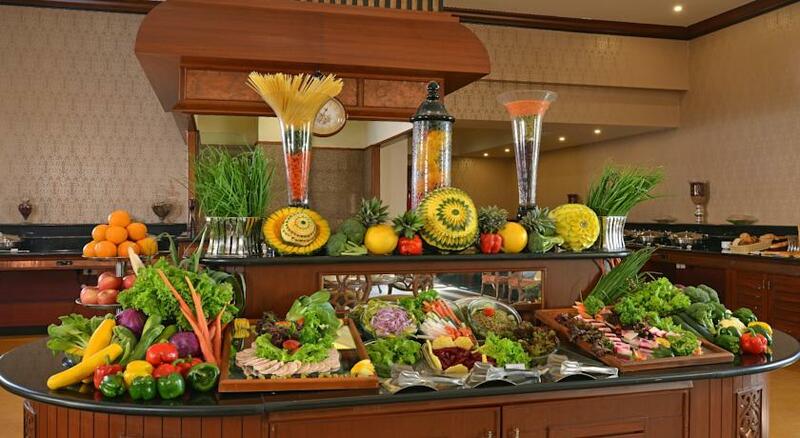 Enjoy fresh fruit basket at your welcome and 24 hr room service at your hospitality. The spacious room is provided with flat screen TV with satellite channels, in-room movies on request, private mini-bar, Wi-Fi internet access, newspaper, tea & coffee maker, in-room safe and telephone facility. 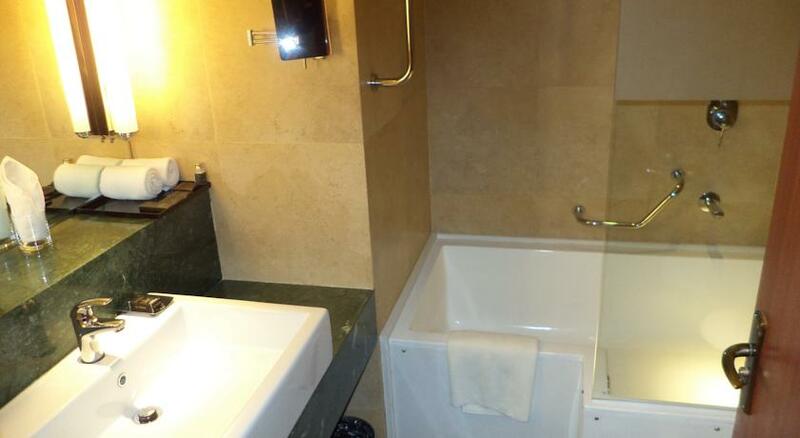 The attached bathroom is given essential luxury toiletries, hot & cold running water facility, hair dryer, comfortable bathrobes and slippers. 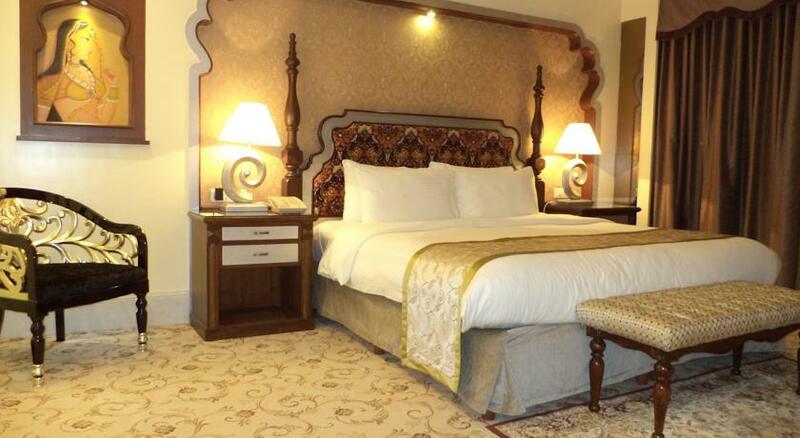 The spacious bedroom is provided with a King Sized double bed with carved canopy, a dedicated space for executive work desk, sofa set with lush upholstery and colorful cushions. 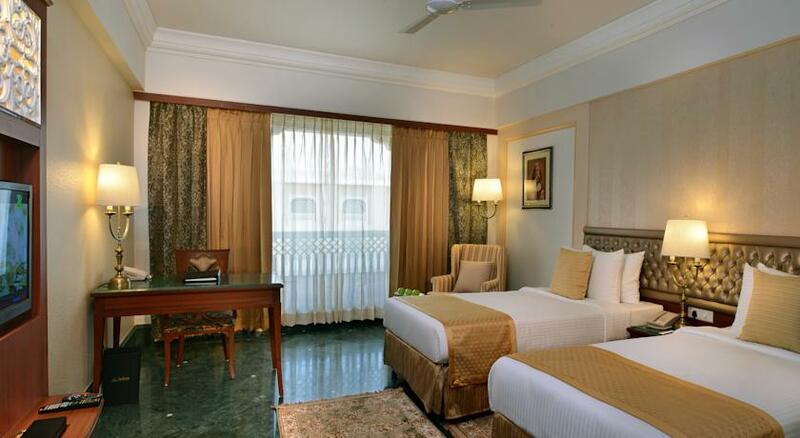 The green marbled floor rooms have rich carpets, designer lamps and patterned curtains to add heritage charm in the room. The attached balcony has ‘Jali’ worked railing that opens to the ‘Blue’ city Jodhpur. All the seven suites are individually designed keeping them unique from one another. 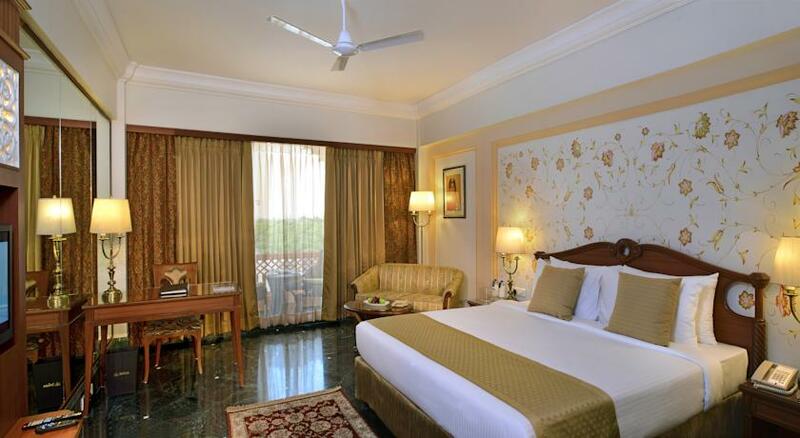 The spacious suites have a bedroom with a King Sized double bed, window side coffee table and chairs. 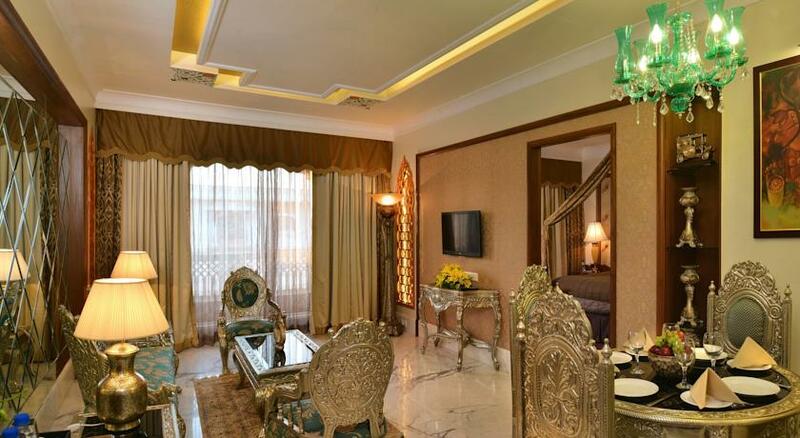 The separate living room is equipped with royal sitting furniture, adjoining it are separate make-up room and executive work desk area. The separate dining room is adequately sunlit through windows to maintain the charm. The attached balcony opens to the masculine Mehrangarh fort. 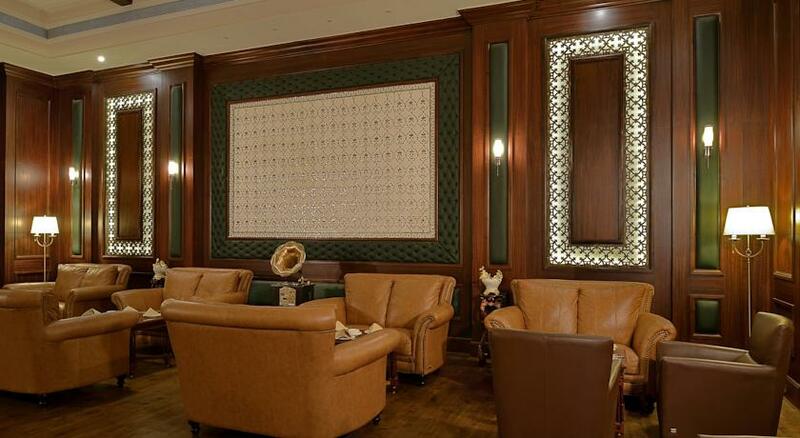 Rich Rajasthani culture is showcased on wall artwork, wall paintings, chandeliers and other furnishings. 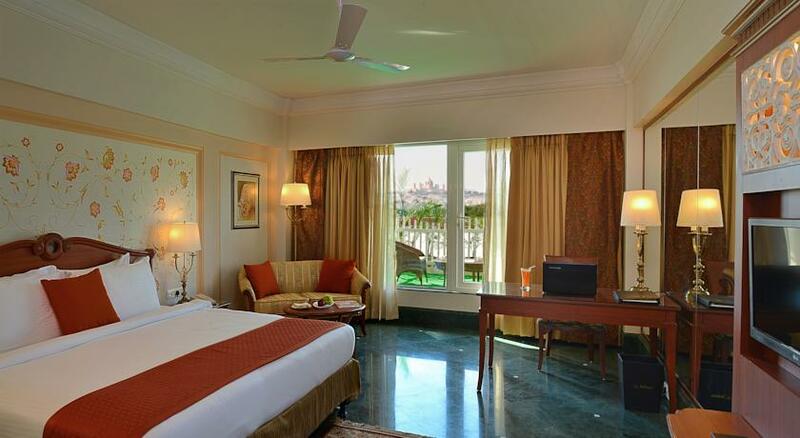 The suite opens to the palace courtyard and lush green garden area. Fresh fruit basket is waiting for you in the room. 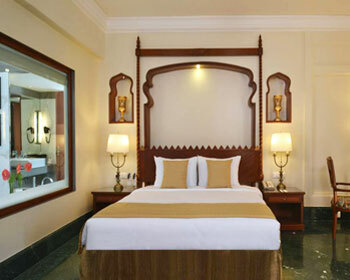 The in-room facilities with your stay are – 2 television sets with satellite channels and in-room movies for your entertainment, Wi-Fi internet connectivity, complimentary newspapers, tea coffee machine, well stocked mini bar, in-room safe and telephone to stay connected with family and friends. Receive round the clock room service at your hospitality. 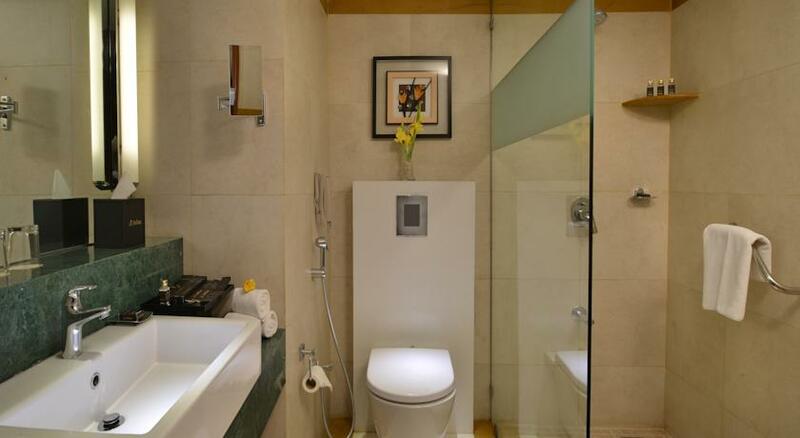 The private attached bathroom is provided with hot & cold running water facility, comfortable bathrobes & slippers, hair dryer and other essential luxury toiletries. 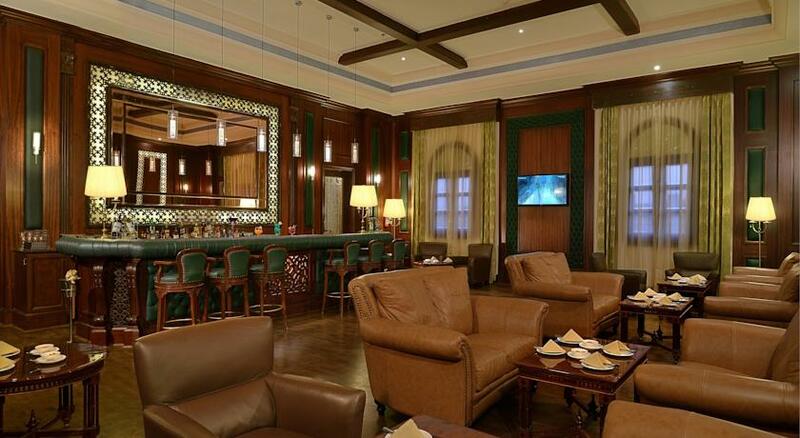 The grand royal stay at Presidential suite is a luxury lifestyle statement. 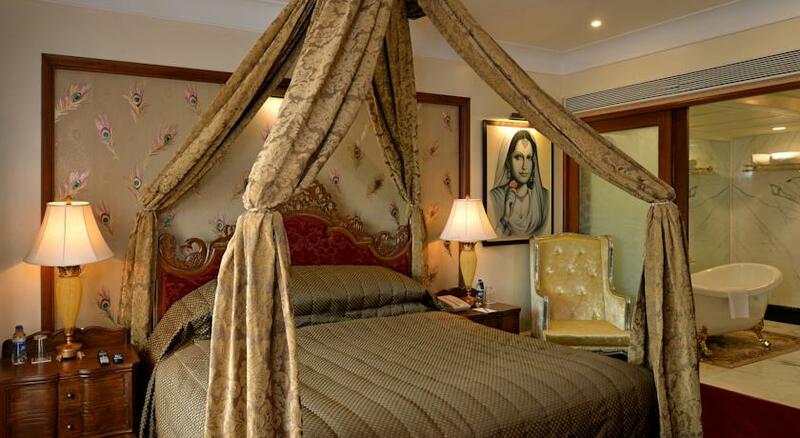 The master bedroom is given a four poster King Sized bed with overhead drapes. 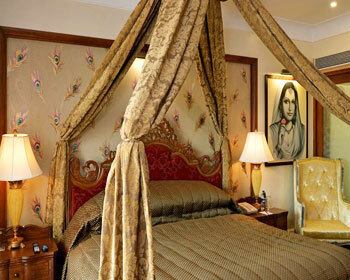 The traditional wall artwork, carved bed canopy and wall paintings add Rajputana ambiance in the room. The separate living room has sitting and dining furniture crafted as old time artifacts. 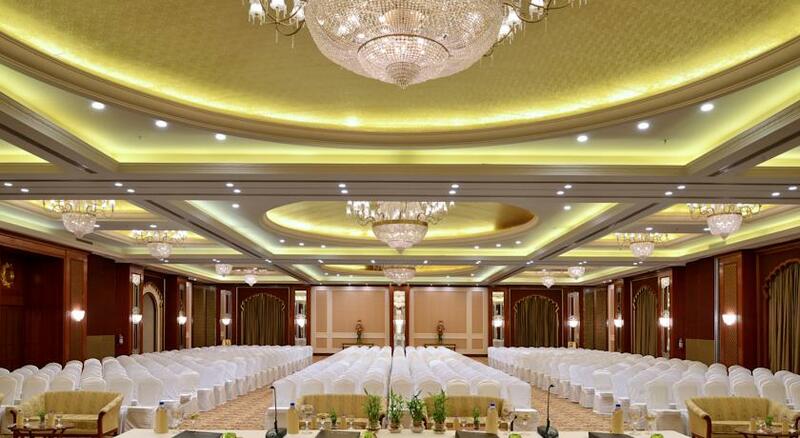 Carved ceiling and chandelier add charm to the place. 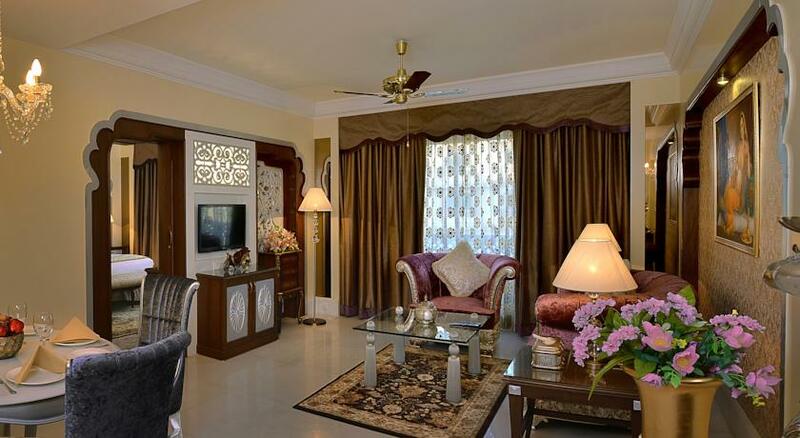 Adjoining living room is a guest room to accommodate any guest with you. A dedicated space for executive work desk is provided to carry office work easily. The rooms open to playful inner courtyard. Stay connected with family and friends with Wi-Fi internet connectivity and direct dial telephone facility. 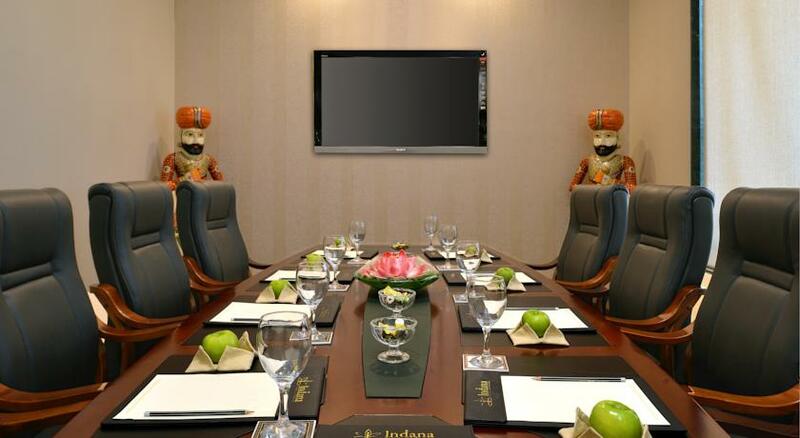 Make it a theater with in-room movies and satellite channels on color television provided. 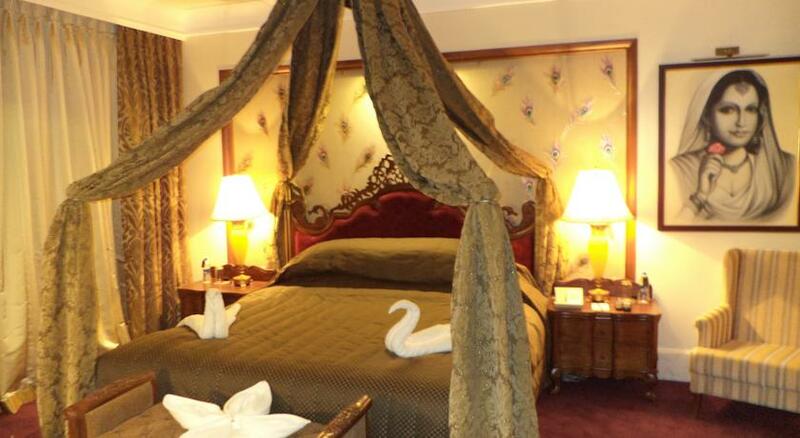 For your hospitality, Palace provides round the clock room service, fruit basket at your welcome and a private mini bar. Get creative with tea & coffee making machine. 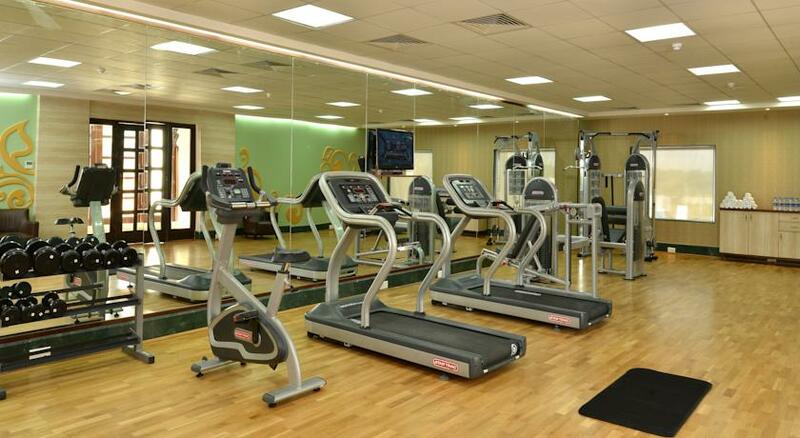 Safety locker, complimentary newspapers and Iron & ironing board are also provided at your comfort. 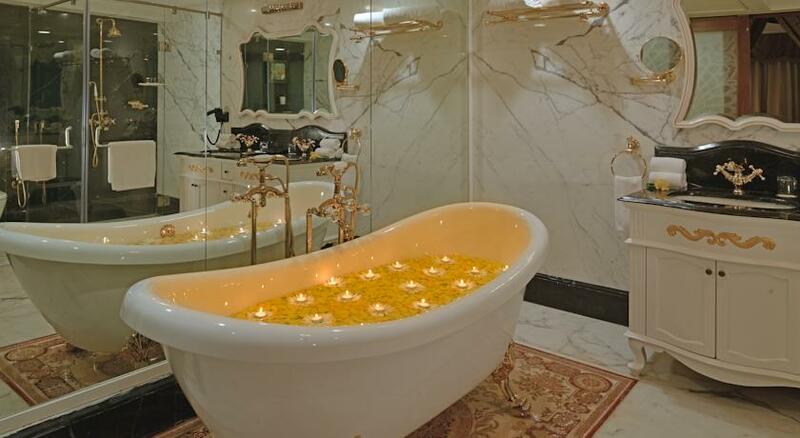 The marble floored luxury bathroom has a romantic setup with petals in bathtub, soft bathrobe, cotton towels, slippers, Hair dryer and Make-up & shaving mirrors. Bathroom is lit up with candles. It has hot & cold running water facility too. A large walk-in shower cubicle is also there. A telephone is also provided inside. Anghiti is a fine dining multi-cuisine restaurant with a Royal Welcome. 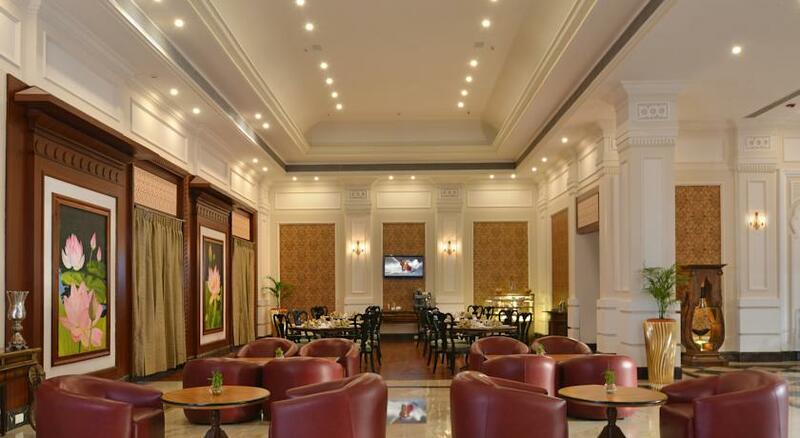 The crafted ceiling, wall paintings, royal motifs, chandeliers, wood carvings on wall, royal upholstery and furnishings bring up the Rajputana ambiance to the dining. 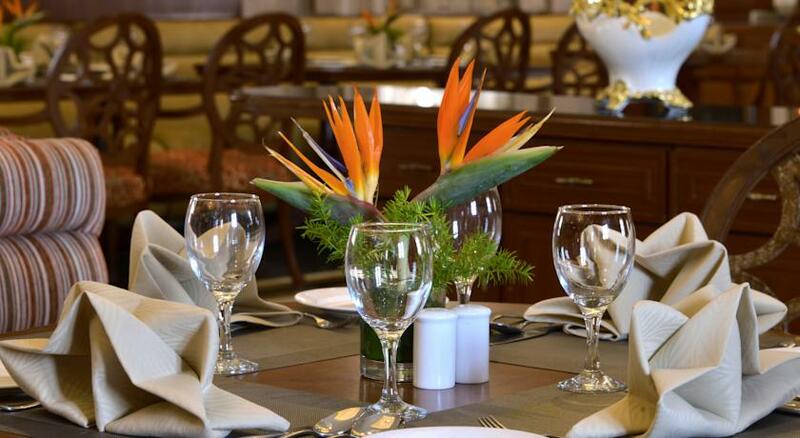 The restaurant serves delicacies from Continental and Oriental style of cooking. It is famous for its traditional Rajasthani dishes. Open for breakfast, lunch and dinner, this restaurant is open till late hours. 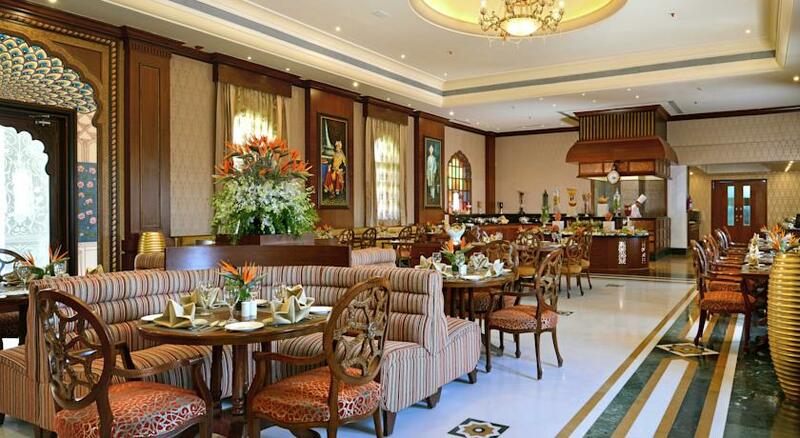 When not in the mood of heavy meal, Lotus Café is the best option to try their light snack and beverages. This Coffee house is a unique setting with beautiful Lotus paintings and similar color furniture. Your favorite beverages are available till late evening. 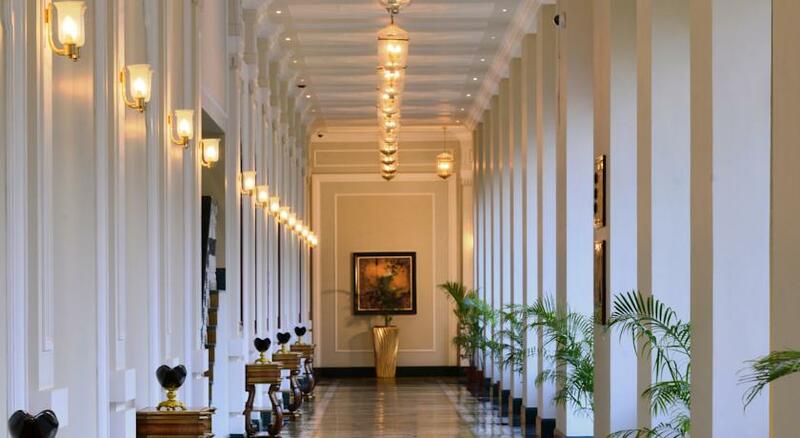 Carved ceilings, crafted pillars and wall hangings add charm to the place. 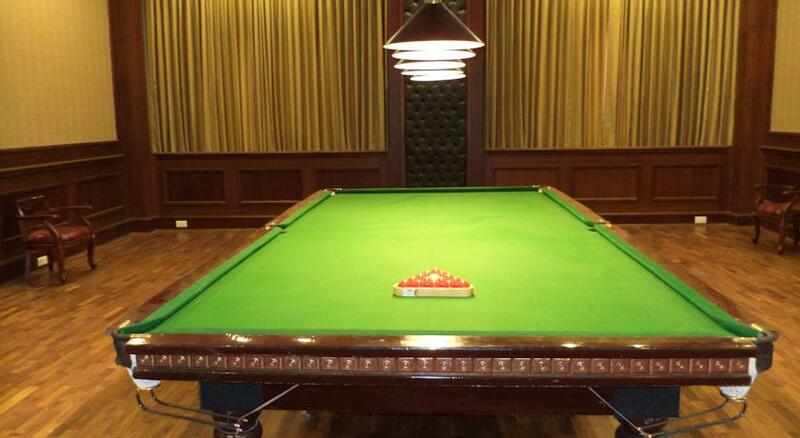 I Bar, a perfect place to hangout with friends for informal chatting or make new companions. The bold themed bar has deck chairs setup by the counter to try their fine collection of wines, whiskeys, vodkas, gins and other alcoholic offerings. You can also book a table and relax on soft sofas to try their mocktails offerings and delicious snacks. 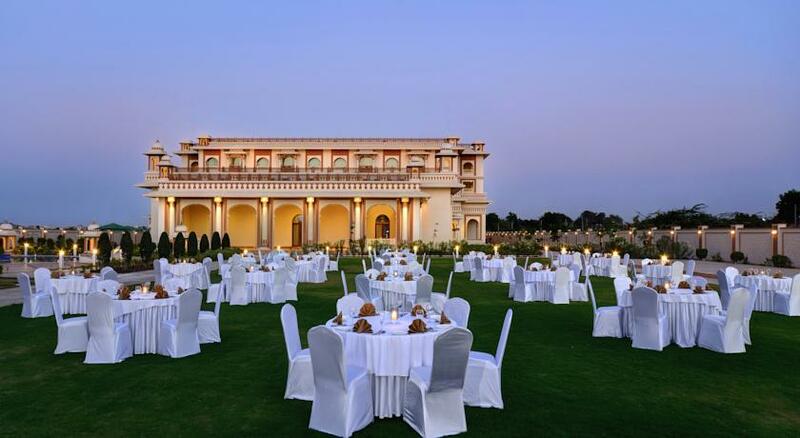 The Courtyard is open area dining setup within the surrounding architecture of the palace and lush green garden by the side. 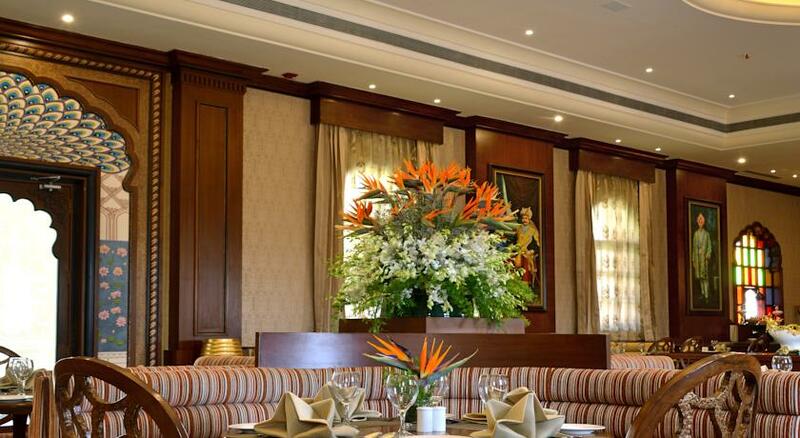 Perfect for an evening dining the ambiance turns out colorful with the lightings and festive atmosphere. Enjoy your dining with live folk performance.